Ask Leo! #648 – How Does a VPN Protect Me? Two friends and acquaintances reached out to me this week with two security-related items I'd like to pass along. From Jeff: "I've been receiving a new phone scam on the landline where a 'computerized' voice tells you 'Your Windows License is about to expire, call our 800 number immediately.' I thought you would like to hear about this so you can warn more people than I ever could." Remember, if THEY call YOU with dire warnings or technical issues you supposedly have it's almost always a scam. If you're at all uncertain, hang up. Then reach out to someone you already know and trust for help. Coincidentally, this came across my desk this weekend: "Inside the Tech Support Scam Ecosystem," a fascinating look at the tech support scam landscape, and why the problem's not going away any time soon. In other news, I've made a (hopefully) minor technical change in the formatting of the newsletter. Ideally you won't notice a thing-- unless you're on a mobile device, in which case things will hopefully wrap a little more sensibly. So there's a lot of talk about using a VPN to hide what we do from our ISPs, and you've mentioned using it when using open WiFi. So just how and what are the protections of this versus just connecting through my ISP? What limitations does this have? Can they "see" what I'm doing (like using a BitTorrent), and that is coming from my account? I'll describe the different scenarios and how you are, and perhaps are not, protected by a VPN. I'll use this scenario as the base: you're in an open WiFi hotspot, connecting to a remote resource like your email, or your bank. The connection to the specific service you're using. The largest area of concern is the connection from your laptop to the WiFi access point. That open WiFi signal traveling through the air can be "sniffed" (or read) by anyone in range with a laptop and the appropriate software. Lately, however, there's been concern about the fact that your ISP can monitor what you're doing. Specifically, they can see every remote site or service you connect to, and can examine all data not otherwise encrypted you exchange with those servers. This secures the path between your computer and the WiFi's access point. Hopefully, it's how your home WiFi is configured, so as to prevent nearby homes or others from connecting to your WiFi, and through it, to your network, without the appropriate encryption password. Most open hotspots at coffee shops, airports, and elsewhere don't use encryption; the password requirement would confuse their customers more than it's worth. That's why these hotspots are called "open". When WPA is used, it protects only the connection between your computer and the WiFi access point. Everything past that point in the diagram above remains "in the clear". That last point becomes important because all the traffic is visible to the hotspot's owner, should he or she care to peek, and to the internet service provider to which that hotspot is connected. A VPN securely encrypts the entire path from your computer to the VPN provider. No one along that path can see your data: not other WiFi users, not the people managing the hotspot, and not the hotspot's ISP. The connection is only secured up to the VPN's servers; the connection from the VPN provider's servers to the final destination is once again unencrypted. That means the VPN provider, as well as any other networking equipment along the rest of the way, may be able to see your data, and can at least see which servers you're connecting to. You're adding steps between your computer and the server you're accessing. The practical effect of this is that your connection becomes slower. How much slower varies based on the VPN service you're using, their capacity, and the server you're attempting to access. Not all remote servers allow connections through VPNs. One non-security-related reason to use a VPN is it can make you appear as if you're located in another country. As a result, many services – such as streaming video services – block connections using VPNs. You're using a VPN (and which VPN service you're using). You're sending and receiving an awful lot of data. The only true privacy is achieved with end-to-end encryption. Unfortunately, that isn't possible in many cases, since it must be supported by the service to which you are connecting. Connections you make via https are completely encrypted along the entire path from your machine to the remote server you're accessing. That's why banks (and other services that allow you to access sensitive data) should use https. Most web-based email providers also provide full https connectivity. 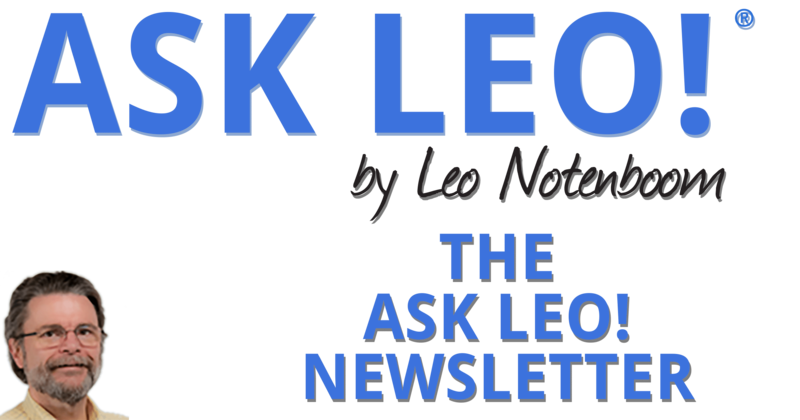 In fact, more and more sites — including Ask Leo! — are switching to support https. Similarly, when configuring a POP3, IMAP, or SMTP connection in your email program, if your email provider supports it, choose SSL or TLS. That's the underlying encryption protocol used by secure connections like https. That way, your email uploads and downloads – as well as your log-in information – is completely encrypted along the entire path to your mail server. Just to complete the picture, if you're using a VPN, and you happen to connect to an https web site, your data is doubly encrypted for part of the trip. Https protects you between your computer and the service to which you're connecting. There's really no practical harm. One benefit is that the VPN prevents your ISP from seeing which site you're connecting to. Related Links & Comments: How Does a VPN Protect Me? Some time ago, I realized the external hard drive I carry with me when traveling was an easy thing to lose. Some of the data on that drive is encrypted in various ways, but the vast majority is completely unencrypted. If that conveniently small, portable drive walked off in someone's pocket, they'd have access to a lot of my stuff. In a forehead-slapping moment, I realized I was going about this all wrong. Continue Reading: How Do I Encrypt a Hard Drive Using VeraCrypt? The Windows 10 "Creators Update" is slowly rolling out via the normal Windows Update channels. If you're impatient (like me), here's how to get it now. What's the Difference Between Spam and Junk Mail? I use Thunderbird to download my email. Most of my email addresses are "@aol.com." Each of those addresses have both a "junk" and a "spam" folder. Virtually everything that shows up in the junk folder is spam and everything that's in the spam folder is junk. What's the difference between the two folders? My more important question: for quite awhile I have been marking all my many emails in my spam folder as junk, moving them to the junk folder, and then deleting them. By doing so is Thunderbird and/or AOL "learning" anything ' or am I just wasting my time? This actually represents a couple of very common points of confusion. One is very easy to clear up; the other, not so much. First, the easy: the terms junk and spam are synonymous. Some email programs or services call it spam, some call it junk mail, but it's the same thing in either case. What you're seeing in Thunderbird is what happens when those worlds collide. The confusion about training the spam or junk filters, however, is both important to understand and somewhat more complex. While I'll use your AOL account as an example, this applies to all email services and all desktop email programs1 that have spam filters. Continue Reading: What's the Difference Between Spam and Junk Mail? What can you do to make sure your account doesn't get hacked into in the first place?